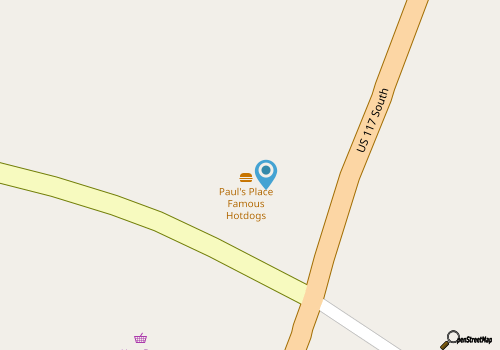 Enjoy a great hot dog with a little dose of local history with a stop at Pauls Place Famous Hotdogs, which is found about 15 miles north of Wilmington in the small town of Rocky Point. A popular local destination for roughly 90 years, this hot dog joint first opened in 1928, and still wows patrons with both the dogs and the accompanying prices. The exterior of Pauls Place looks like it hasn’t been changed very much in the past few decades or so, except for a clean coating of white paint. The interior is just as basic but enticing, with a central ordering counter and a handful of places to sit and chow down. Visitors who have never been to Pauls before, and who are just passing through along US 117, will want to go right for the dogs which can be ordered "all the way" for no extra charge, with a hearty topping of onions, mustard, ketchup, and meaty chili that’s not too spicy. Patrons can order a side of fries or chips to accompany a dog, and can even buy a couple jars of the famous relish to take home and enjoy. A local classic for nearly a century, Pauls Place Famous Hotdogs is a fun and historic stop en route to the Cape Fear shoreline. Call (910) 675-2345 for current hours.